Vinales, 쿠바의 카사 마가리타 | 호스텔월드에서 예약하세요. Casa Margarita offers comfortable accommodation, modern and cosy construction, where every detail was built especially thinking about the comfort of its guests. 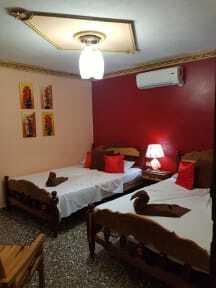 With two independent and private luxury rooms. With a restaurant in the accommodation itself you can enjoy delicious breakfasts and taste the best Cuban food. Very close to the centre of Viñales and with varied services that will make you fully enjoy your stay. 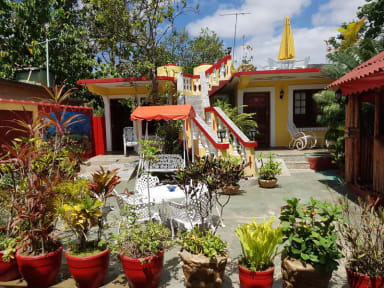 Located just 400 meters from the centre of Viñales, very close to restaurants and emblematic bars of the city and internationally known as Bar 3J, Restaurant El Olivo, Charlie'sBar, etc. The accommodation is accessible by any means of transport and close to essential services such as the Bank, Hospital. The accommodation has 2 luxury rooms, private and independent, with private entrance. These have two double beds each, with linens and towels included, air conditioning, ceiling fan, minibar, TV, hairdryer, wardrobe, safe, etc. Each room has a private bathroom with hot and cold water, a rain shower and basic hygiene items.